Your collection is fantastic and has inspired me to start collecting myself. Just trying to decide if I should bother with boxes or just get the actual carts. Thanks, Darran! I appreciate it. The great thing about the Lynx is that it's not a HUGE amount of games... enough to make it a challenge, but not overwhelming. It took me 8 years to get this far, but that's with a lot of "downtime" while I was poor/unemployed/into other things. In my opinion, boxes matter IF you are planning on going all nuts with a large collection. It won't cost you all that much more to get boxes, and if you get boxes, you also generally get the instructions. While not always important, some games really need instructions to get the most out of the game. Besides, it helps with resale value, if you ever do end up selling in the future. I own full source code, artwork, audio, and rights to Ultra Vortek (now named Ultravore due to a copyright conflict) and Mechtiles. I acquired this at the same time I acquired CyberVirus. I also own a Beyond Game prototype cartridge of CyberVirus, which is quite different from the version I finished and published. UV has not been worked on in years, but is honestly very close to being complete for a simple fighting game with only 2 characters to choose from. It does support comlynx and several special moves per fighter. It's missing a damage system, and I always wanted to add more fighters but that's a time-consuming process and a big reason why the development stalled. Maybe someday I can get back to it, and just complete it with the existing two characters. Mechtiles is very incomplete. It looks like the BattleWheels engine, but has a cockpit and some cybernetic dinos to battle. I've considered selling off the Mechtiles source before, but it would take some effort on my part to make it a stand-alone code build (currently it's intertwined with the CyberVirus code), so this has been a low priority item for me. Thanks for the update on those games! I am one of the ones who hope you complete at least one of them. Ya gotta know I'll buy it. Actually, to be honest, I'm a little disappointed you haven't said anything about my collection. I hope you realize that I have bought MOST of my new, full-price games from you. I don't have an accurate count, but I'd have to guess I bought at least 13 full-price games from you. Pretty much everything you put out, except for Ponx and Lexis, which I got with a Lynx unit auction from eBay. Why, I even met you at the CGE in Vegas back in 2003, where I bought Sokomania (among other Lynx and Jag items.) But Songbird has gotten a decent amount of my money, both Lynx and Jag products. So, thanks for doing what you do! So Carl, what does YOUR collection look like? Do you have a complete collection, or did you end up not keeping a copy for yourself of the games that you sold out on? How many carts do you have? Any idea? Sorry about that - I sometimes don't realize that forum names match up with orders I receive over the years. I knew you had ordered stuff from me before, but had forgotten it was that much! Thanks, I really appreciate that. You obviously have one of the most complete Lynx collections I've ever seen. That takes a lot of time and cash to do - very impressive! And keep up the good work. Believe it or not, I may actually be missing an odd game or two from the Atari days... I think I'm missing Gordo, for example. But I have everything that's been published from Telegames and myself, including 1/25 CC CyberVirus and 1/60 CGE 5th anniversary. I also have a few cool prototypes, such as the CyberVirus one I mentioned which is on PCB that has a Beyond Games logo imprinted on it. The missions are completely different from the ones I published. 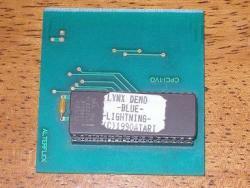 I have a Lexis proto which I received straight from Shadowsoft, and it has a slightly different intro sequence but basically the same gameplay AFAIK. I have been thinking about doing a sequel to CyberVirus. It's a natural given the mission-based approach. I even have a new enemy (deathblade sentry) which is all coded up and ready to use. But again, there's that free time thing that bogs me down. Keep on doing good work for the Lynx. That's okay.. I forget that I'm not me here, but some guy with a silly name. You're welcome, Carl. Again, thanks for doing what you do! Thanks, Carl. Couldn't have done it without ya. And you know I'll buy the next cart that comes out. I have MegaPak 1, after all. That sounds like a fantastic collection! Maybe one day, you'll have time to post some pics? Love to see what the protos look like. Oh, I didn't realize CGE 5th had 60 copies... I assumed 25. I wonder why none of them ever surface on eBay? I'd love one... Er, don't suppose you'd ever consider reissuing a few, eh? The CyberVirus sequel sounds like a good idea... you should pick something you can complete in a relatively small amount of time. But you probably have a "real" job getting in the way, don't ya? Thanks for the history lesson on your coding. I always wondered how much coding you did on the various games. 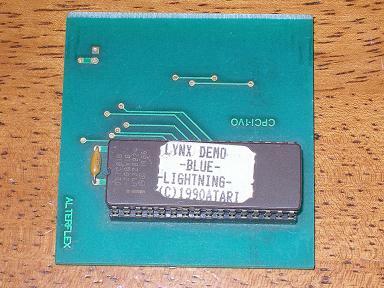 Is it possible to get a pic of that Blue Lightning Demo? The EPROM one? I was going to use it to put an example of what I am looking for on my 'WTB' thread. I added a side shot, so you can see how tall the chip/seat is. Is the Epyx version the same as the Atari produced one, as for as content? I'm interested in that as well. I think it is, but that is a very good question. SMEG... thank you for the pics! 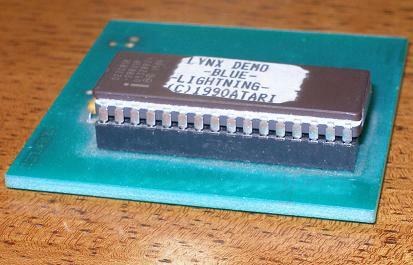 Yes, both of the Blue Lightning demos are identical. I let both play for a bit, and they showed level 1, then level 9. Also, interestingly enough, they both have a copyright on the title screen of 1989, but have a 1990 copyright on the labels. I've emailed the author a couple of times but have not received a reply, so I'm guessing it's one Lynx item I will not be able to add to the collection. I thought I'd do a good old fashioned bump to update this collection. In 2008 (at the beginning of this thread) I had 112 titles, 109 unique. I am now up to 124, with 113 being unique. Well, it's admirable enough, but it does kinda defeat the purpose. You'd be buying games with no intention of ever playing them, and the Lynx has a lot of highly playable games. If your purpose is solely collecting for collection's sake, then sure, have at it. But it makes it more of a hobby, like collecting coins or stamps. Games are meant to be played. But if collecting is fun for you, then there ya go. Collect away! It would make for a unique (and valuable) collection, to be sure. Thanks that what i aiming to have one collection of all new unopened stuff. and one collection for all playable games. including those super multi games for lan parties. what you think? used carts can be picked up under $5 off ebay posted! dirty cheap! Of course now, a couple of years later, and I can't call my collection "complete" ...not even with the quotes around it. Alas, I am too poor to be able to buy the new games that have come out. No Hot Dog or Relief Pitcher or the Poker one. However, I do have a pre-release version of EricDeLee's Eye of the Beholder. I can't afford to buy the complete version from him now either, but at least I have the game with the save chip. 720 Degrees: This game was not completed and is not available in cartridge form at all. Bitchy: This game is completed but only 15 copies of this were made on cartridge and no more will be made. Cabal: This game was not completed and is not available in cartridge form at all. CGE 5th: Only 60 cartridges of this were made by Songbird Productions and no more will ever be made. Dungeon Slayers: Harry Dodgson has the source code for this but no cartridges have been made available to the public. Dynablaster: The fact that Atari Smeghead has this game on cartridge is a special case and the public at large should not have access to it? Escape from the Planet of the Robot Monsters: This game was not completed and is not available in cartridge form at all. Guardians: Storm Over Doria: This game was only 30% completed before being canned. No cartridges exist. Geo Duel: This game was not completed and is not available in cartridge form at all. Marble Madness: Should a cartridge of this be available to the public at all? I've never heard of this apart from Smeghead's collection. Mechtiles: This game does not exist in cartridge form, but Carl at Songbird Productions has the rights to this and should be releasing it on cartridge in the future. The Princess & the Barbarian: This game was not completed and is not available in cartridge form at all. Rapide Race! : The fact that Atari Smeghead has this game on cartridge is a special case and the public at large should not have access to it? RC Demolition Derby: This game was not completed and is not available in cartridge form at all. Rolling Thunder: This game was not completed and is not available in cartridge form at all. Ultra Vortek: This game does not exist in cartridge form, but Carl at Songbird Productions has the rights to this and should be releasing it on cartridge in the future as "Ultravore." Vindicators: This game was not completed and is not available in cartridge form at all. The whereabouts of the prototype are also unknown? Am I not accounting for any? Well, I've included games that I've purchased very recently, which are still on their way to me in the mail, as part of the games that I "own." I've been sent notifications by all sellers that the games are on their way, so I truly hope that they'll all make it to me okay. Thus, if I take a picture now, it won't include all the games that I've posted as owning. Nevertheless, once they all arrive, perhaps I'll take a picture and add it to this thread. Actually, I already have to add 2 more games to the list of games that I own, namely Bubble Trouble and Hyperdrome, as I just ordered them today and already received notice that they are on their way.... I must admit that I'm pretty excited about it. I made a release of this game. I have some in stock.